The Navy said the new deployment was not based on any specific threat. 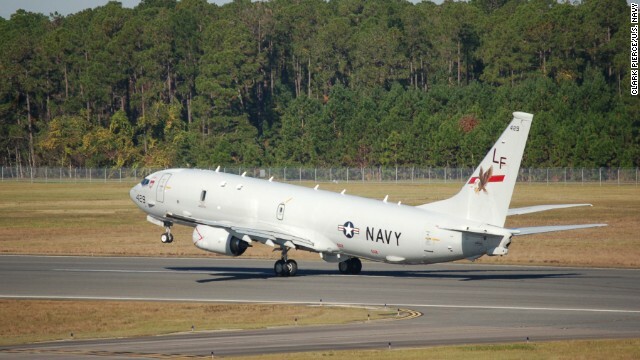 "The P-8 is a true multi-mission platform, which will continue to provide us invaluable capabilities," said Rear Adm. Matt Carter, commander of patrol and reconnaissance, said in statement. "The number of submarines in the world is increasing rapidly," Carter also said. "Other countries are either building or purchasing advanced, quiet, and extremely hard to find submarines and we need to be able to match that technology to be able to detect them." New U.S. aircraft at Kadena coincided with Vice President Joe Biden's arrival in Japan to start a trip that includes stops in China and South Korea. It is too bad..... US have funded indrectly to China Military for the last 30 years since US open a freetrade market to China and Help China to export their products all over US and the Wolrd. Nowsday,you have travel all over the countires from North America to South, from England to Europe, from Russia to Asia... Made in China are dominating the consumer markets. China are in surplus every years, because the strong growth rates of the economysystem and GDP each year. America are losing by the economic policies, while America have more Nobel Prize, that is too bad. Better a world with evil America than Chinese panda , I'm not American but don't really understand why so much hate toward America,we all know it, even Chinese and Russians knows it, any brutal war America will win, even if there is ten people left into this planet,mi bet they will all be American . China is run by thugs of communist Kleptocatics and has been shoving their BS to the rest of the world since they stole power from KMT 70 yrs ago. The difference in Democratic and Communist is no one ask the question in CCP China. People are treated at THINGS and its time for the rest of the world to fix this now. Removed UNNECESSARY Chinese. Actually Rob T, the Communists never "stole" power from the KMT, they beat them fair and square in 1949 after a long and bloody civil war! Did you ever see those Chinese newsreels coming out of Shanghai in 1949 where the KMT(or Nationalists) as they are called dragged young men out on the streets and shot them down like dogs just for being suspected of sympathizing with the Communists? Evidently not! Besides, are the current leaders of China any worse than our own corrupt politicians here at home? I think not. if you are killed one day all of sudden, I am not surprised. Excuse me: What's your point? enough of wars in middle east , it is time to fight chinese . America is getting ready for a war !! What a dumb post this is! If we went to war with China, just who is going to finance our huge spending deficit, brought on chiefly by the military? Besides, this idiotic war will produce no victors since we'll all parish if it ever comes!!! Is this a joke? Do you really think the only way the United States can finance its budget is through China? The main economic problem with going to war with china would be our exports. However, considering the trade deficit to China, their economy would suffer more than ours. Our government can finance its own debt. We don't need the Chinese to do that. With that said, I don't think a war with China is at all likely. China is now making extremely high tech products because we trained them on how to make them for example Apple -> FoxConn. This is just an example. Please purchase your holiday gifts wisely. If it is made in China then you are giving their military more money. You guys seem to forget that next to J apan, China is our biggest creditor as it finances a huge part of our spending deficit. If that was to stop, the right-wingers in Washington will gut both Medicare and Social Security and then defund our already declining infrastructure and schools and libraries will close. Who in the right mind wants that? errr.... your technology is still 50 yrs behind US' military. Your arrogance is comical! The moment you really think they are that far behind, you are already beginning to loose, they do not show boat about what their technology is, showing up on the latest CNN/Sky exposé . But make no mistake they are charging forward with unlimited budgets and already leading in certain military technological fields – the golden rule NEVER underestimate your enemy history is littered with examples of just that! Yes, I'm sure the Americans will be very afraid of what you just said. I use to be a soldier, and I would rather die on my feet fighting that live one moment on my knee's, but there is one catch we for one American death I will take at least five or six down to the fires pits hell with me! So here is a question for you: Are you dressed for the weather? It's gonna get hot where we are going buddy, and we are gonna be your stop flight to hell with no return back, and I will enjoy it! So if you think that our solidiers fear you? HA! We live for the challenge and are damn greatful for the opportunity whether to live in glory or die in glory, but we will fight to the bitter end! Never under estimate the US. I use to be a soldier, and I would rather die on my feet fighting than to live one moment on my knee's, but there is one catch for one American death we will take at least five or six yours down to the fires pits hell with us! So here is a question for you: Are you dressed for the weather? It's gonna get hot where we are going buddy, and we are gonna be your one stop flight to hell with no return back, and I will enjoy it! So if you think that our solidiers fear you? HA! We live for the challenge and are damn greatful for the opportunity whether to live in glory or die in glory, but there is one thing you can count on and that is we will fight to the bitter end come hell or high water. Is that what you really think? Good. Keep on believing it. Your stupidity helps us. We hope you will underestimate us. Please do. We have lots of nasty surprises for you if you really need them. We are not even remotely afraid of China. Have you noticed that they have no significant transport capabilities for troops. Their Navy is small and untested. Their Air Force hardly ventures offshore. Come now: Please underestimate us. you have no rythym nor any clue. feel free to gag on your own spittle cause you certainly cannot rap. Now that's one heavily armed regional passenger jet. May your life turn out to be meaningful and happy. Try your best to make the most of your lifetime opportunity. You "just" have to learn good lessons to grow on from your parents and positive influences, continue your education, find a meaningful career, gain the affluence that education and career brings, treat people you meet and your friends with respect, and also be patient and kind and care for family members who also want to be happy after they chose to share their lives with you. Stop arguing about minor incidents. 1. the attempted genocide for decades of our Native American Indians who nurtured and worshipped their lands centuries before Europeans arrived. Our citizens and leaders not only murdered many thousands of innocents, and the warriors who bravely defended their families and lands, but past and inequalities and injustices continue and have resulted in the predictable loss of peace and hope in our Native American communities. 2. the enslavement of families in Africa and the ensuing acceptance of slavery for decades in our country. Our citizens and leaders not only forced many thousands of people into slavery, but past and inequalities and injustices continue and have resulted in the predictable loss of peace and hope in our African-American communities. 3. the continuing glorification of militarism and war, past and present and future. Many millions of our citizens have already bravely sacrificed their health and lives for and because of the causes and conflicts created and continued by our leaders. Yet still, our leaders are somehow permitted to coerce or order our finest youths to defend more of their chosen causes and to attack more of their chosen foes. Would you mind not using that Tea Party screen name, whoever you are? Donald made a very intelligent post above and I tend to agree with him. There has been too much bragging already over these aircraft as it is! How you think every other country was established? Africa never trampled on the tribes? People didn't take over land? Kill those who contested it? Mr. MacDonald, I fail to see what Relevance your comment truly has to the Article..Further more, I feel as though your comment was a drive byText, an unsolicited one of course..Don't be so obtuse to think that some here don't have your agenda understood...If I have reached the wrong conclusion regarding your comment, for what ever reason, allow me to give some needed (unsolicited of course,) If want to express through comments perceptions about perceived Social injustices, then take them to the proper forum, this forum is an advanced one.. Thanks for caring, but this country is way beyond being concerned for past, present and future atrocities. We currently have bigger fish to fry and are failing miserably at just about all of them. Cynicism, distrust and lack of tolerance for each other is the new America, welcome aboard. Good posting, spfx, How true that is!!! #1, the Indians didn't "worship" the land, they didn't own it, and what they loved to do more than anything was fight each other..
#2 the "slaves" from Africa were for the most part sold into slavery by other black Africans. (some were taken into slavery when the ship had more room, and the ship's sailors would take those that were selling their captives and make them captive as well) Today, their descendants (the black slaves) are 70% don't know who their father is, are 90% unemployed and don't want to get a job, basically a sect of society that is useless..
#3 it's been 40 years since there has been a draft, NO ONE holds a gun to an enlistee's head and makes them join the military..
basically, stop spewing crap and do a little research. It would be cool to get Russia involved in these military operations and stream it live on ESPN. DGM, please enlighten us, your practical and implementable solution(s) to the problem you cite is...? Please Donald, you are clearly Chinese. I have seen many of these type of posts. As long as the US. is a responsible world power it will have to honor its Allies and protect them otherwise China or any other two bit power Wanabe will isolate the US and do UNspeakable things to it. Look at what China did to the Philippines, the used brutal force to annex a chunk of it. If the US shows weakness now they will do the same to her. Bug off, Don. You're one of us as well. Hey "John Smith" or is it mohamed? Failed state? Sorry to burst your bubble, we don't have daily bombings, beheadings or garbage in the streets. We are still the biggest economy in the world and the only world power. People are dying trying to come here and we have an elected government unlike yours. I think you may be on to the possible fact that "John Smith" may not be who he says he is. If John lives in America, he should hit the road, if he don't, I hope he never shows up, either way, this individual is a comlpete disgrace to all of us who live and breath. That may very well be but his statements about our aggression, both direct and subversive, cannot be disputed. And all of it has gotten us nowhere. Yes your right. Greedy nation terrorist person react if US acts. "Only world power" - i beg to differ – you think Russiaa' 10 K nukes is not a World power - you are very naive! Hey John, just a thought, If America is the root of all evil, which is a very potent statement, I have to ask, why are you here? maybe you ought to think about relocating. You possibly could try living some place were your speech is monitored, or you might have to ask permission to travel to visit a loved one hoping you'll be allowed, or if you post comments on a public forum that is frowned upon, you 'll probably wind up in prison performing hard labor. The list could go on and on. Why don't you hit the mental reset button in your head, and realize just how good you got it, if you can't do that, than get out. How many Iranians did Saddam kill, including with poison gas, with NO HELP from the USA? USA got rid of Saddam, removed Iran's and Shia Islam's biggest enemy of all. Iran never even said thank-you. LOL @ John Smith...Sure you are "JOHN SMITH". These were instances when order and needed to be maintained. Your comment is not true .theres a big reason why America did this .you only focus in negative side. I disagree with that. Russia, and the Soviet Union before that, is the root. In fact, If the Soviets hadn't invaded Afghanistan Bin Laden probably wouldn't be around. There is so much goddammed anti-US propaganda coursing through the internet the comment-section of the entire web has become a spectacle! So the US is the root of all terror huh? Terror did not exist before the USA? Quite psychotic. I suppose the US was to blame for the Nazi's, despite their role in dismantling that nightmare? Or what about Stalin's 'reign of TERROR'? The US is to blame for that as well? Despite the simultaneous charge that the US was irresponsible in its OPPOSITION to it? The fact you don't even give a word about Russian shenanigans AT THE SAME TIME is proof enough you are not to be trusted. So how many countries did the USSR invade in the last 60 years? How, precisely, do you know that that did not have an influence on the decisions made by the US? The ONLY thing that bothers me about these aircraft is the lack of crew survivability. As far as I've read there's no systems(s) for getting the crew out of a shot up plane. The planes the Air Force bought for the C-135 program and the J-Stars programs were, essentially the 707 air frame. Now, it didn't have Emergency Egress systems either BUT it did have Military Power available on the engines. A Safety Wire on the throttle Quadrant kept it from being used except on purpose. When Joe Patroni slammed the throttles forward on that 707 in 'Airport' he broke the wire and accessed the Military Power available from the P & W engines. We had the same throttle pedestal on a Boeing 707-320 we refurbished for the Air Force back in 92. You mean this plane is less survivable than the ancient P-3 it's replacing? Don your parachutes and bail bail bail in case it's shot up. What a Wonderful World It Would Be!... What planet is this you're talking about? When does the next shuttle board? Yadda, yadda, yadda…..lots of ranting of the obvious. You can dream, wish, yearn, desire, and demand all you want, but know this – there will NEVER be peace on earth while mankind is here. Never, ever, ever. Zip. Nada. Zilch. If there were only TWO people on this planet, they would eventually fight. It’s human nature. After the Revolutionary War, U.S. citizens continued to serve in the military and bravely sacrificed their lives in 19 more wars. 19 more wars, all of which occurred in foreign countries with the exception of the War of 1812, and the Civil War and American Indian Wars when we turned our guns upon our own people. Donald, you are why the NSA monitors these web sites! It would be nice for a change if America just minded it's own business for a change. "Coincidentally" sending military hardware to a disputed area is hardly minding one's own business. When it comes to keeping the local bully in check, I'll go with this expanded version of minding our own business. that's the whole point, it is our business...if you think we should only have business inside our borders, you have confused us with Canada. What does China have to say about THAT! Our more evolved descendents, looking back at us with sadness and scorn, will realize that our world citizens and leaders should have condemned, long before now, ALL hate and violence and barbaric wars against ANY fellow, equally perfect feeling, living being. You're making a BIG assumption my friend. As resources dwindle, mankind could easily evolve in the opposite direction. Our dependents could easily be looking back on this time as the "good old days". evolved or not... hopefully they will have less annoying posts. Really? You need to use all three names? I guess when you write manifestos in your spare time it might lend more credibility than 'Donny McDonald.' I think you should go ghetto, call yourself the the D Mac D or some other nonsense. It would be more fitting of your diatribes. I would think reading a jihadist recruitment pamphlet would sound eerily similar in tone and voice to one of your manifestos. Please tell me you don't have access to envelopes, small bits of metal, and live in a small shack in the woods. "not even qualify for a reply"...hilarious. I guess it's time for CNN to start beating the drums of war again. And the majority of our U.S. citizens give 26% of all of their dollars taxed every year to “defense” spending. Progress toward these noble goals is persistently threatened by the conflict now engulfing the world. It commands our whole attention, absorbs our very beings. We face a hostile ideology - global in scope, atheistic in character, ruthless in purpose, and insidious in method. Unhappily the danger is poses promises to be of indefinite duration. To meet it successfully, there is called for, not so much the emotional and transitory sacrifices of crisis, but rather those which enable us to carry forward steadily, surely, and without complaint the burdens of a prolonged and complex struggle - with liberty the stake. Only thus shall we remain, despite every provocation, on our charted course toward permanent peace and human betterment." please keep this in mind when bringing up the "military-industrial complex"
Keep token on that crack pipe! My paycheck is not shrinking because of fifty-year-old sins. It is shrinking because corrupt Washington politicians would rather pander to corporations sending millions of jobs to China than protect our country. Spot on – but there is more. Our nation's leaders pander to so many special interests, nothing gets done. No one is applying the appropriate screws to ensure that anybody who needs a job will have one available. Not true. Defense spending is NOT 26% of our budget. IT is 26% of the discretionary spending. Things like welfare, social security, are non-discretionary, mandated by law, and make up something like 70% of the total budget. So, it really is 26% of 30 % of the budget, which is about 8%. My numbers may be off a little, but are MUCH closer than yours! This is a blog, not a short story submission site. Chinese proverb: Don't dip your stick in someone else' soup bowl. We say: Let's see how deep we can dip our stick in the mud. "Chinese proverb: Don't dip your stick in someone else' soup bowl." Maybe they should have followed their own proverb then. I wish we would stop sticking our nose where it doesn't belong .... or at least keep quiet about it! I know a lot of people in the ASW (anti-submarine warfare) community. From talking to these people I get the sense that the P-8, like the P-3, is totally incapable of detecting a submarine that doesn't want to be detected. Tom knows "a lot of people in the ASW community" who say a sub that doesn't want to be found by a P-3 can't be found? Get new friends Tom. I'm an ex-pilot and we were absolutly great at it. U.S. subs were hard but the Soviet subs were like shooting fish in a barrel. The problem now is that the Russians patrol under the ice-cap. But the attack subs have to come out to play and P-3's are great at finding them. I agree with you Rob, Tom needs more informed friends. I have 2500 hours in P3's where I logged many of those on top of Soviet Subs.... on top all the time!! Yeah...P-3s are the most widely used anti-sub aircraft in the world because they can't detect subs. Genius. Say hi to those "friends" in your head. His friends are all bubbleheads in denial. I have known a few of these over the years. You know the types, they say there are only two types of ship, submarines and targets. The old SH-3 was very good at humbling them, though once back on the beach they would talk their trash like they won the engagement. Can it predict the terrible condition the country will be in, in another few years, if we continue to allow the Democrats to run the country? Oh, sorry. I had a computer glitch. That comment was meant for the article about the new super computer. I seem to recall that the last Republican administration turned the record Clinton surplus into the worst economic debacle since 1929. Did you forget about that? Hopefully, the Chinese didn't read this article, and it's still secret. "your words prove that you are insane, sound like from the outspace"
"Outspace...the new gay club for all you oiled-up guys!" Another fight? When was the first one? The Korean War – albeit a stretch. Does The Korean War ring a bell? These planes too are told to report their flight plans to chineese authorities. What a friendly trade partners !! Correction: "What a friendly Boss that we have". I don't know we are biting the hand that feeds us and keep our economy stable. Economically speaking it’s more of a symbiotic relationship than an employer / employee one. Let's see. Do nothing and get called a wimp. Do something and get called an antagonist. So either way, be $crewed. Damn if you do, damn if you don't. Might as well..! None of you know what you are talking about. You all can go 2 He11. I totally agree, General. Most of these comments here bragging on those "reconnaissance planes" are truly ignorant! Like I said before, we don't need any kind of confrontation with China as we need that country as well as it needs us. Let our friendship with China continue!!! This has been a scheduled deployment for years. Has nothing to do with the current situation. Just a happy coincidence. How can you say that? They developed, built and deployed the P8s in the last week, didn't you know? more spying from the US? Who would have guessed? Spying? This isn't spying, this is exposing the spying. Tired of hearing about people upset that the US "spies". This always has been and always will be part of inter country behavior. Are you pro-China? If so, pack your bags and move to China. We don't need unpatriotic bleeding hearts in the USA. So, we spy and China doesn't. Is that what you are saying? You must be an extremist left nutter-case. Support your government and quit defending your nice friends. People like you make me sick! Do you say that about someone who's say, pro-Israel? Manatee...why is it that you nut jobs always assume everyone who comments on a website is American? The internet is international, people from timbuktu could be commenting on here. There's nothinng preventing them from doing so. there is no law demanding that only americans can comment on websites of amerlican companies or news networks.. Next time just keep your mouth shut and people wont know youre an inbred hick. your right, I've been very critical of the US for a while... not because I don't like you guys, but the opposite actually... Now that peoples from many nations may be forced to choose a side in a impending conflict. I will Always choose America's. "more spying from the US?" This isn't spying, this is monitoring. If you want to paint it in sinister tones, at least get it somewhat right and call it surveillance. These crews' primary mission is antisubmarine warfare, but their most common mission is (as we called it in the 1980s, I'm not sure if the name has changed) Sea Surface Control. Find and identify surface vessels of any kind – commercial, military, private craft, etc. To Sausage: If you live in any of the G-20 nations, please be assured your country has an active intelligence service, and they collect information and conduct surveillance. Yes, again, the USA has active intelligence services......and they've been around for 100+ years. Chances are, YOU, personally, have benefited from the data collected by an intelligence service, your country's, or the USA. Countries collect information on other countries. It's a fact of life, just like the sky is blue on a clear day. It is an anti-submarine patrol plane, not a reconnaissance aircraft. It's job is to find and sink submarines. It can lay minefields too. It can in a pinch, be used to shoot missiles at ships, but that is a secondary mission. Reconnaissance is a part of 'patrol'. I'd say covering 58,000 square miles ocean looking at, taking pictures of, and noting course, speed, national register and name of any and all ships above a certain size or a specific type qualifies as recon. On occasion we would look for a specific vessel and only that vessel, a dedicated relocate as we called it. this would be a nice target for China's low range ballistic missiles, big and slow. probably no need for these powerful missiles. cruise missiles will do it. You would have to be as dumb as a box of rocks to think you would fire a ICBM or a cruise missle at a aircraft. That's what happens when people who know nothing about a subject and fire off there mouths about it. You don't use ballistic missiles, or even cruise missiles, to shoot down an aircraft. From P3AW, what squadron(s) were you with? I was with VP-31(staff), VP17, VP-9 and VP-94. Good times. You're implying that the P-8A would be sent on solo missions, within range of these low range ballistic missiles. Do you think that the most powerful and advanced military on earth would just haphazardly place resources in harms way? Sending one of these aircraft out alone wouldn't be anything unusual. We flew all sorts of missions solo in S-3s. And even with China and REALLY borderline missions, we've sent aircraft out alone, even on risky missions. Search online for EP-3 and Hainan island to get a sense of what can happen. Ballistic missiles and cruise missiles are mutually exclusive terms. Your implication that they are the same thing is wrong. However, neither has the ability to shoot down aircraft in flight regardless of the aircraft's speed or size. BUZZZZZZZZZZZZZZZ. Wrong answer. Ballistic missiles are for fixed ground targets. You might be thinking of surface to air missiles. And think again if you think the Chinese will risk shooting one of our aircraft down. Well since the Chinese "threat" is a 50 year old barely working aircraft carrier and similar submarines with 1960's technology, lets save our money and send some old P-2 Neptunes out of the scrap yard to meet this so called threat. They just launched a rocket for a moon mission. The Aircraft carrier is about 30 years old. Regardless if is still pretty low tech. The slope take off doesn't provide enough assistance to launch fully fueled and armed aircraft. So basically the Chinese Jets will have reduced range and armaments. On the contrary, they have been building new ACFT Carriers, bigger than ours to get more ACFT support. Where have you been for the past 15 years or so? THey have been modernizing their military and have good technology that General Electric, Clinton, rouge companies selling secrets, and stolen secrets through cyberspace. China has been producing most of the products including military products and sold to us half the price it takes to make here. We don't make anything anymore and we are the slaves of China that we purchase their junk and don'tthink about our self reliance and economy. I just laugh when the government say "create jobs". What jobs? Opening another McDonalds so we can be the "fliiping burger nation"? Sorry I went off course, but this is just something to think about and stop undermining China's so called "friendship with fake smiles and knives on hands" ready to back stab anytime when you least expect. Perhaps we need more money from our boss (China) to cover for the expenses to deploy these aircraft in the Pacific. Goddang it, should've never checked off the SR-71. They are already building the SR-72. And this thing is so fast its already flown past you and left before you realise it was there. Anyone with half a brain knows that the answer to your question is a resounding Yes, Olim! Besides, why can't the Russians send their new reconnaissance aircraft to J apan, too? We sorely need a balance of power here! China was the one who created the security zone without consulting if they actually had any legitimate claim over those islands. That makes them the provocateur in this case, and you, an idiot. How do we not know the Chinese were not the first to provoke everyone? No the extremist cnn reader bleeding hearts rather defend a commie nation than our. That George Patton dude above needs to stop disgracing that name. The person writing under the name is a extremist coward commie. But you’re hear reading and posting… doesn’t that make you a extremist cnn reader bleeding heart? Who is the bigger fool right? The one spouting the nonsense or the one that comes back to their website over and over to post?